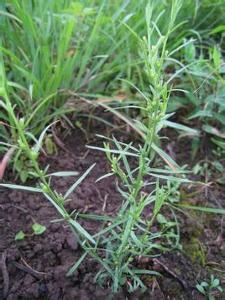 The drug is the dried or fresh whole herb of Thesium Zongifolium Turcz. (Family Santalaceae) , growing on grassland or pasture near forest, and distributed in Heilongjiang, jilin, Liaoning, Hebei, Neimenggu, Gansu, Ningxia, Qinghai, Guizhou, Sichuan and Yunnan of China. Pungent, slightly bitter, cool; lung, liver and spleen meridians entered. The herb is used to relieve exterior syndrome and clear heat, expel wind and relieve convulsion, for the treatment of cold, heatstroke, bronchitis, infantile malnutrition due to improper feeding, infantile pneumonitis, infantile cough, cough, infantile convulsions. Decoct 6~12 g, or steam with egg for eating.